NFL free agency has a ripple effect on the league that impacts the fantasy football value of not just the player who signs with a new team, but also the values of his new and former teammates. With the first phase of free agency wrapped up, it’s a good time to take stock of what went down across the league. Here are the biggest fantasy football winners and losers from the 2019 NFL free agency signings. The Browns signal-caller was already trending up in fantasy circles before Cleveland pulled off the blockbuster trade for Odell Beckham Jr., but Mayfield’s fantasy value is now solidified in QB1 territory. Sorry to be the bearer of bad news, but that means you aren’t going to get him at a value when fantasy drafts roll around in August. Look for Mayfield’s ADP to settle out in the range of the seventh quarterback off the board, which will likely place him in the sixth round (and earlier than that in home leagues). Unfortunately, that’s too early to draft a quarterback at proper value given the significant depth at the position this year. Like Mayfield, Chubb also stands to benefit from Beckham being on the field. Opposing defenses having to account for Beckham should give the Browns’ run game more room to operate. Of course, fantasy owners will need to factor in Kareem Hunt’s suspension into Chubb’s fantasy value. That being said, Chubb is still a front-end RB2 with RB1 value over the first eight games of the season. Gaining a future Hall of Fame wide receiver is typically a good thing for a quarterback. Carr gets a major upgrade at wideout this year with Antonio Brown along with Tyrell Williams and J.J. Nelson. Compared to last year’s wide receiver corps, that’s like going from a 1985 Pontiac Fiero to a 1985 Ferrari Testarossa. 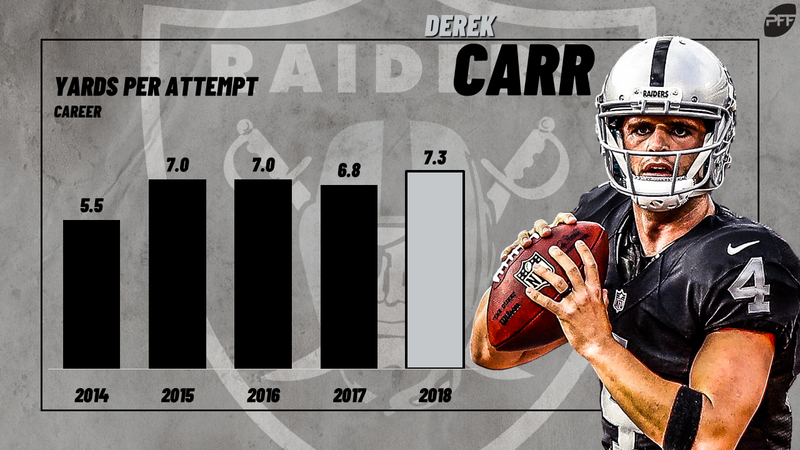 While he wasn’t a fantasy factor last year, Carr is coming off career bests in passing yards (4,049), yards per attempt (7.3), and completion percentage (68.9). He’s a strong bet to take a step forward is should be considered a top 20 fantasy quarterback option. A somewhat surprising top-10 fantasy wideout last season, Smith-Schuster goes from playing second fiddle to being the guy in Pittsburgh following Antonio Brown’s trade. There’s no denying that this is a good thing for Smith-Schuster, but be careful with your optimism. Smith-Schuster saw nearly 25% of the Steelers’ targets last season, so there isn’t much room to go up. He certainly could see a 4-5% increase in target share, but anything more than that is too ambitious. That being said, Smith-Schuster is now locked in the second-tier of fantasy wideouts along with his former teammate Brown. No, he isn’t going to fill Brown’s shoes, but Moncrief is in a position to immediately step into the No. 2 job for the Steelers. Given Pittsburgh’s pass-heavy ways, that role will likely mean WR3 production from Moncrief. Of course, he isn’t guaranteed that spot, so we’ll need to keep a close eye on him and James Washington in the offseason. PODCAST: Jeff Ratcliffe recaps the latest in free agency. Believe it or not, landing with the Jets is actually a good thing for Bell. Sure, we don’t expect the team to be particularly good in 2019, but the team doesn’t need to win a ton of games for the player to put up strong fantasy numbers. In New York, Bell steps into a thin depth chart where he’ll have minimal competition for touches. He should have no problem averaging more than 20 touches per game thanks to his ability to play all three downs. With that sort of projected workload, it’s hard to not view Bell as a top-6 fantasy running back. Likewise, Sam Darnold stands to benefit from the stability Bell will bring to the Jets’ offense. After having to share backfield duties with Alvin Kamara over the last two years, Ingram now steps into a situation where he’s the clear lead dog in Baltimore. Ingram figures to be heavily involved in the run game and will add fantasy value with his ability to catch the ball out of the backfield. In Baltimore, he’s a good bet for 200-plus carries. Last year, the lowest fantasy finisher to top 200 carries was Sony Michel at 34th, and all but two running backs over 200 carries finished as RB2s or better. Ingram’s experience should also have a positive impact on Lamar Jackson’s fantasy outlook. Ingram in Baltimore is also a good thing for Kamara. With Ingram suspended over the first four weeks of last season, Kamara was the No. 1 fantasy running back. 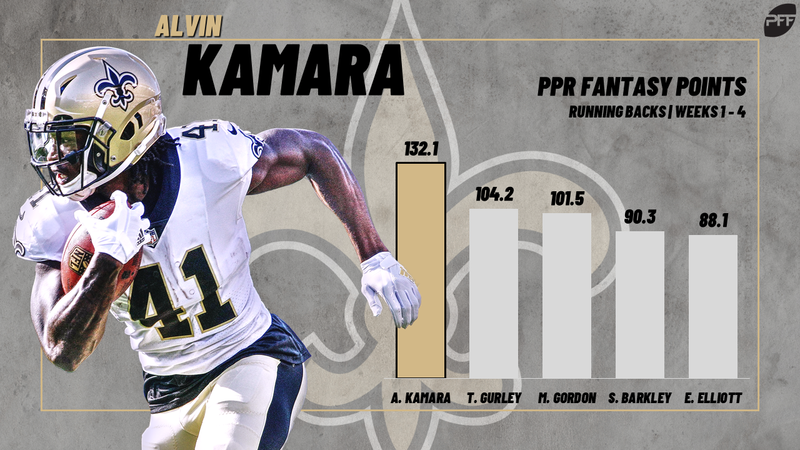 It isn’t wise to expect that sort of production out of him in 2019, but Kamara is now locked into the elite tier of fantasy running backs as a top-five option. The Saints did sign Latavius Murray, but he isn’t as much of a threat to Kamara’s workload as Ingram was. That being said, Murray’s value as a best ball handcuff options is very appealing. With Murray now in New Orleans, Cook is far and away the Vikings’ top running back option. Behind Cook, Minnesota currently has youngsters Mike Boone and Roc Thomas on their depth chart. Provided he stays healthy, Cook figures to see a big-time workload this season. While he’s certainly getting a bit long in the tooth, Jackson still has some big-play juice and he landed in the perfect location to tap into that skill set. Under Doug Pederson, the Eagles have used a vertical element in their offense with Torrey Smith and Mike Wallace serving in that role over the past few seasons. Jackson is an upgrade on both players and continues to be an appealing best ball dart throw. Jackson’s big-play upside also helps Carson Wentz’s fantasy value. Despite taking a step forward for fantasy purposes last season, Godwin proved to be an inconsistent option thanks to being buried as the Bucs’ No. 4 receiver. But with Adam Humphries and DeSean Jackson out of the mix, Godwin is now inked in as the No. 2 option behind Mike Evans. We don’t expect a major leap forward for Godwin, but his role makes him a good bet for more consistent fantasy production and solidifies him as a back-end WR2 in fantasy drafts. Glory days. Well, they’ll pass you by. Are the glory days over for Roethlisberger in Pittsburgh? We can’t say for certain, but his fantasy value takes a major hit with Antonio Brown now in Oakland. Roethlisberger is coming off a massive 2018 campaign where he posted the seventh-highest single-season passing total in NFL history at 5,129 yards. He also finished second among quarterbacks in fantasy scoring. Without Brown those numbers will almost certainly decline. It’s tough to view Roethlisberger as anything more than a back-end QB1. 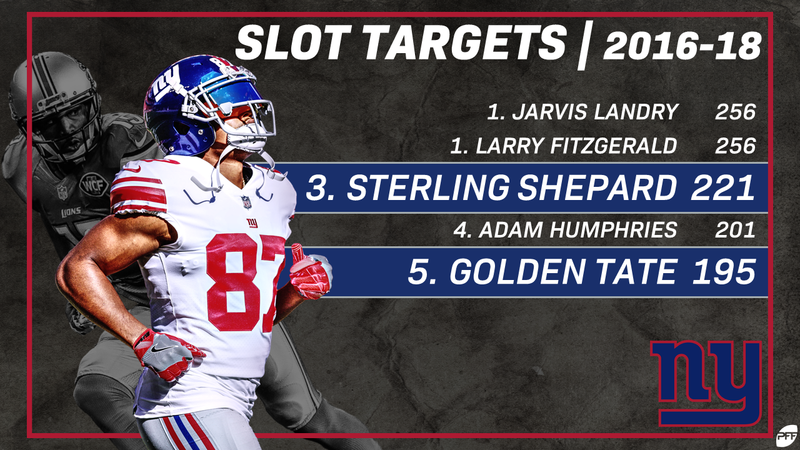 Not only did Shepard lose the advantage of getting to play opposite Odell Beckham Jr., but the Giants also signed a similar player in Golden Tate. It’s still unclear how the team plans to use their receivers, but it’s looking likely that Shepard and Tate will cannibalize off each other this season. While some expect the Beckham trade to also negatively impact Saquon Barkley, we don’t see the move as a bad thing for the running back. The Giants ran the 12th-most attempts against eight-plus defenders in the box last season, so he was already seeing plenty of loaded boxes. But Barkley isn’t just a fantasy standout for his work in the run game. His ability as a pass-catcher is what makes him elite, and if anything, Barkley could see even more work in that area this year. It was tough to believe that the Ravens would enter 2019 with Edwards as their lead back. But with Mark Ingram now in house, Edwards slides back into handcuff territory. We’ll always have December of 2018, Gus. The former Falcons running back landed with the 49ers where he’ll again be a part of a crowded backfield. Coleman figures to split time with Jerick McKinnon and Matt Breida in San Francisco. McKinnon isn’t guaranteed to be fully healthy after suffering a torn ACL last year, but this is looking like a full-blown three-headed committee. That’s going to make it tough for Coleman to be anything more than an RB3 this year. There was a lot of fantasy hope surrounding Humphries as we entered NFL free agency. He was coming off a breakout year where he finished 24th among wide receivers in fantasy scoring and the rumor mill linked him to some prime landing spots, including the Patriots. When the dust settled, Humphries signed with Tennessee. Sigh. The Titans were one of the league’s least pass-heavy offenses last season, and that isn’t likely to change. Humphries’ target total is almost certainly going to take a hit, which is going to translate to decreased fantasy production. He’s now in WR5 territory.